ABUJA-THE Inspector General of Police, Ibrahim Idris, has barred operatives of the controversial Police Special Anti-Robbery Squad, SARS, from conducting stop and search on roads. He also stopped them from acting as bodyguards to prominent Nigerians just as he warned them against further delving into civil matters including land disputes, personal disputes, debt collection and all matters considered civil. Besides, the police chief said all operatives of the anti-robbery unit of his organization must henceforth always appear in official unit clearly marked for identification. Idris, who spoke during a meeting he held with commanders of the Police Anti-Robbery Squad, at the Force Headquarters, said the Nigeria Police Force under his leadership was concerned at recent clsmour by some Nigerians that the unit be scrapped and attendant opposite reactions by others. He said they can only conduct stop and search operation on roads only when necessary, adding that such operation must be only on the permission of Commissioner of SARS or Deputy Commissioners and Assistant Commissioners of Police in charge of operations in the commands they are answerable to. The measures, he said,were as a result of the police administration’s demonstration of sensibilities to the yearnings and demands of modern policing. Other measures which the police leadership has taken to reform the SARS, according to the IGP, were the designation of the Deputy Inspector General of Police in charge of operations to lead the unit as its strategic commander, appointment of a Commissioner of Police as a field Commander of all activities related to SARS and the direct supervision of SARS operations in each state Command under the Commissioner of Police in charge of the state through the Deputy Commissioners and Assistant Commissioners of Police in charge of operations. As part of the reform measures, the police boss hinted that psychometric test, training and continuous assessment of operatives will be deployed to SARS to determine the suitability or otherwise of their role in keeping with acceptable standard operating procedures. He also said the unit would be confined to its established role of preventing, confronting and solving cases related to armed robbery and generally protect the public from armed robbery and other violent crimes. “The Nigeria Police Force under my leadership, shall operate strictly guided by the human rights principles as enshrined under the United Nations Charter on human rights and other extant laws. “In demonstration of good faith to the aspiration of the Nigerian populace, I have given mandate to the IGP’s Monitoring Units and ‘X’ Squad and other oversight units of the Force to monitor the activities of the SARS operatives, while in the same vain, citizens are encouraged to avail the police ways to improve SARS operations across the nation, “he added. 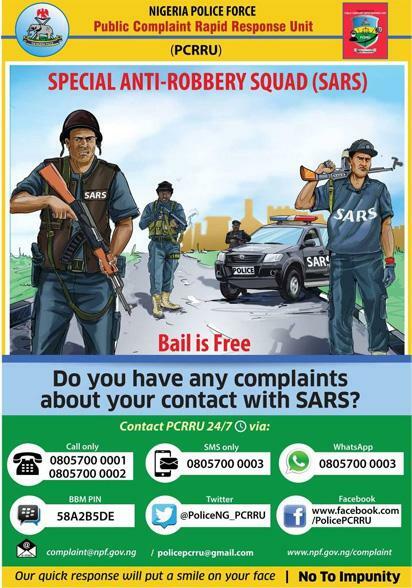 The post IGP bars SARS operatives from stop and search duties on roads appeared first on Vanguard News.